City of Devils. “While Lemmy is Away… RUSTY EYE WILL PLAY!!! City of Devils talks on Rusty Eye’s live at the Rainbow 2-hour set recording. While Lemmy is Away… RUSTY EYE will play. As we’ve been carrying on about this week, Lemmy will be at Club Nokia tonight to be deservedly feted for all he has done to make this world a more tolerable place. 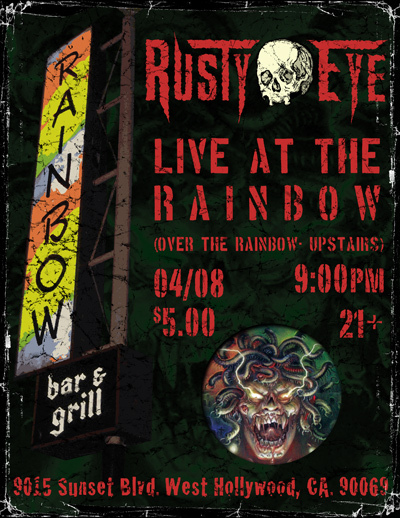 But while all that fun is happening, back at his second home RUSTY EYE will be putting on a two hour set on the second floor of the Rainbow Room. Yes, two hours – that’s no joke. They will be recording the show and playing tracks from Rust n’ Roll, Stendhal Syndrome and Possessor. It all starts at nine and will be followed at 11:30 by the Hells Belles Burlesque show. We’re guessing Lemmy will return to the ranch in time for that. The cover is just $5.